A new examination of a vast wave of cool gas rippling through a distant galaxy cluster has revealed a surprise about its shape, changing what we understand about cosmic weather. This "cold front" is estimated to be roughly 5 billion years old, so was expected to be a little hazy at the edges by now. With detailed imaging revealing it still has fairly crisp boundaries, astronomers are having to rethink how these cosmic weather patterns form. Data from NASA's Chandra X-ray Observatory was used to create a detailed temperature map of a 2-million-light-year-long ripple of gas sweeping through the Perseus galaxy cluster – one of the largest objects in the Universe. The sheer scale of the wave might be mind-boggling, but the physics behind it are more or less a beefed up version of the kinds of swirls and ripples we see when two fluids slide past each other. Called Kelvin-Helmholtz waves, they appear as whirlpools where fluids moving at different velocities touch - not unlike the milk swirls in your coffee. Small groups of galaxies falling into the Perseus cluster over billions of years have contributed to a vast cosmic metropolis 11 million light years in size, with some leaving their mark in Kelvin-Helmoltz waves as they whip through the neighbourhood. A concentration of hot gas twice the size of the Milky Way was discovered in the Perseus cluster just last year, thanks to data from the Chandra X-ray Observatory. The wave in this new study was first seen in 2012. It's not only far smaller than the 2017 discovery, but contains a cold front that's 50 million degrees Celsius colder than its surroundings. Mind you, at a sizzling 30 million degrees, 'cold' is still relative. These hot and cold fronts are remnants of the cluster's early days, a time when a handful of galaxies settled together to form a core that became surrounded by material that was several times warmer. As a steady rain of galaxies grazed this cold-hearted cluster, those regions swirled together, forming giant ripples made of warm and cold patches. The colossal scale of these events means even though these waves are moving at hundreds of thousands of kilometres per hour, they've still taken billions of years to spread out. So astronomers expected the edges to be rather diffuse by now, as the gases have mixed thanks to various forms of space weather. What they saw was anything but fuzzy. Combining information from the Chandra X-ray Observatory with the European Space Agency's XMM-Newton and the old German Roentgen (ROSAT) satellite has allowed the team to create this map of the different temperature zones. Not only were the edges still crisp, there was a clear split in the cold front's leading edge. The most likely cause of this baby-smooth skin is a phenomenon called magnetic draping, previously proposed to explain similar sharp edges in similar voids and concentrations seen in galaxy clusters. As the pressure of moving cold gas pushes and pulls its way through intergalactic clouds of plasma, it sweeps up a magnetic sheath that builds strength. It's this magnetised cloak that helps keep the warmer gases outside from touching the cooler core of the wave, preserving the two temperatures for a longer period. 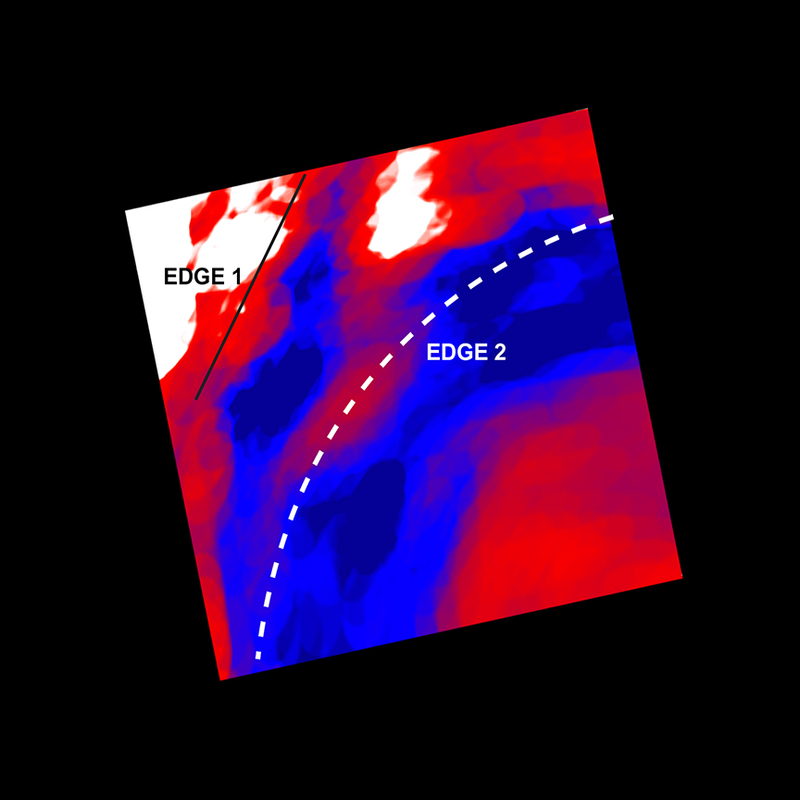 The researcher proposed the large split in the cold front's edge could be the result of a patch of dense, low entropy gas 'falling' out of the wave. So far mathematical models have backed up the hypothesis, with the new data also helping astronomers nail down the precise strength of the wave's magnetic sheath. Now that astronomers have figured out the role magnetic draping plays in shaping the gradual spread of gas and energy in galaxy clusters, they can also fine-tune their understanding of the evolution of the Universe's most massive structures.